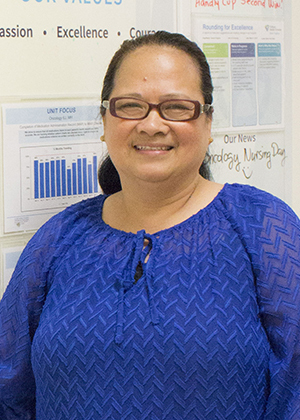 Lorminia currently works as a Clinical Quality Care Leader with Trillium Health Partners, and is the very first designate from the Mississauga Hospital site. Her initiative in seeking continuing education in the field of oncology has broadened her ability to create positive changes in her clinical practice. Her de Souza Nurse Designation included a clinical fellowship centred on the role that nurses play when supporting patients receiving oral systemic therapies, as well as the vital responsibilities nurses must be accountable for, including storage, safe handling, safe administration and management of side effects. She also aimed to create a quick reference tool for front line nurses to gain access to information easily.